Templates allow you to set up multiple recurring rotations (patterns). Each template can be any number of days, and can be aligned to the real calendar by assigning the start date (Day #1) to a real date in Template Setup. Once you have set up a template, you can then copy the data into the Current Schedule by Initializing the schedule. 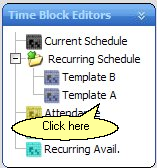 You can view and edit templates that you have set up from the left menu under Recurring Schedule. Here is an example of a template. The number of days in this template is set to 3, which means that the pattern repeats itself every three days. After creating a new blank template, you have the option of filling that template with the recurring schedule, or another template. 1. 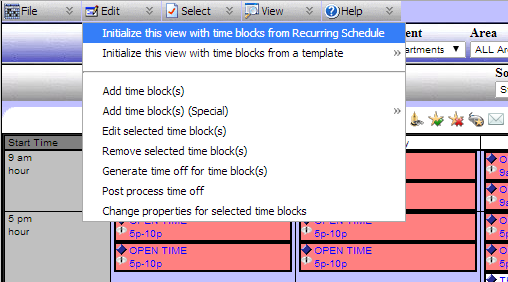 Go to the Current Schedule and choose the time period (view) that you want to initialize. 2. Click on Edit, choose Initialize this view with time blocks from a template. 4. Confirm when asked to proceed with the initialization. The Schedule is now initialized. As you can see, the pattern started on Tuesday. This happened because we set the start date of the template to be on Tuesday January 30th.